Geopathic stress (GS) occurs where the Earth’s electromagnetic field becomes distorted. The Earth resonates with an electromagnetic frequency of approximately 7.83 Hz – Schumann resonances (SR), which falls within the range of (alpha) human brainwaves. Underground streams, sewers, water pipes, electricity, tunnels and underground railways, mineral formations and geological faults distort the natural resonance of the Earth thus creating geopathic stress. Electromagnetic radiation (EMR) or sometimes called electro-smog or electro-stress is generated by most electrical appliances, electrical cables, transformers, hair dryers, electrical shavers, microwaves, mobile masts, cordless telephones and mobile phones. Geopathic stress is one of the major reasons properties don’t sell. People naturally don’t feel well in properties where geopathic stress is present. Once geopathic stress is cleared people find that the buyer is secured. Helios3 is a high tech device that simulates the Earth’s beneficial frequency (a soothing 7.83Hz field) allowing our bodies to tune in to its rhythm. In this way, we protect ourselves from the negative impact of geopathic stress and electromagnetic radiation. In short, Helios3 counteracts the negative effect of geopathic stress and electromagnetic radiation by balancing the human energy field with the Earth’s resonance for optimal harmony. 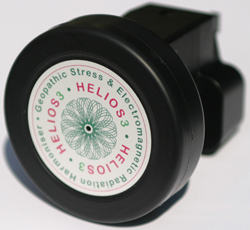 Once plugged in Helios3 will start to rebalance your energy and harmonise the energy of your home or office. “The most extreme benefit from the Helios I have noticed was when I sat on a Eurostar train recently and before we even started moving felt extremely light headed and nauseous. On commenting about this to my friend she said it was probably because they now had wireless on the train and of course its effect is amplified many times by being in a “metal cage”. Sure enough, there was a woman using wireless internet across the aisle. I got my Helios 3 which I always take when travelling to protect myself in hotels, and plugged it into the electrical socket by me. INSTANT RELIEF! and the children with us also immediately said they felt better! What a fantastic product this is – I feel for the first time I can protect myself almost everywhere – at home, office, in hotels, in trains!! “Jan, Wanted to let you know about positive feedback from the Helios 3 device. Put the device in my 1450 sq. ft. condominium. The one floor home is over a crawl space/cellar which is high enough to stand in most parts. Under the dirt, there runs a stream along the North side. I know that this is not good Feng Shui. Also with all the cellular towers put in during recent years along with the popularity of WIFI Internet connections, which most of my neighbours now have, we were getting unwanted energy. In the household, we have experienced health problems since moving in during 2005. With the Helios 3 device in place we are sleeping more soundly. Less hours of sleep required. Seeming to make better choices. My elderly mother seems more rested. I took out the device for three days around April 13th and put it in a house I am trying to sell for clients that was very difficult to sell, as I am a Real Estate Broker. On April 15th it was shown by a buyer’s agent. Late that day we had an acceptable contract offer. As soon as the seller signed the offer next day, I took out the device and returned it home! I felt the lack of the device those few days. During an inspection by a contractor and the buyer the next week I put the device in during the day. When the inspection was over, late at night I drove over to the house and took the device back!! I knew that property had energy problems and had tried some Feng Shui remedies. Still we were on the market over 5 months and no acceptable offers. Price reduction after price reduction did not help the situation. No one ever stated the house was overpriced..Sellers had spent tens of thousands of dollars on a renovation, having many labor problems, cost overruns, poor choices. Consistent with bad energy. Now at least they can get rid of the place even though they have lost thousands of dollars. We close escrow on May 15th.